While some countries are left to deal with fraudulent elections, Canada is busy cleaning up the aftermath of the #tweettheresults fiasco. Twitter is famous for broadcasting news before traditional media outlets pick it up (and for prematurely killing celebrities), but the recent election raised some interesting issues about a person’s right to tweet. That means all media, via any medium—TV stations, newspapers, Joe Schmoe with a Twitter account—can’t publicly transmit results during the 3-hour blackout period. If you do, you could face a fine of up to $25,000. Elections Canada doesn’t monitor social media, though, and won’t open up an investigation until someone complains. Elections Canada won’t confirm or deny any complaints from this election, but in 2000, they did bring charges against Vancouver blogger and software designer Paul Bryan, who published Atlantic Canada results on his blog. It wasn’t like Paul innocently leaked the numbers—he took a satellite dish and positioned it so he could pick up an eastern CBC feed. In the next short while, over 10,000 people visited his site and nearly crashed his server. Five weeks later, the RCMP knocked on Paul’s door. He challenged the constitutionality of the law all the way to the Supreme Court, where he incurred a $1,000 fine and six-digit legal fees. Section 329 dates back to 1938 and was intended to prevent broadcasts of results in Eastern Canada from influencing voters in the West. It was more enforceable back then, because radio was the main means of “instant” communication. Some say the law doesn’t reflect the age of self-broadcasting. They say it’s obsolete, unfeasible, unenforceable and violates their right to free speech. 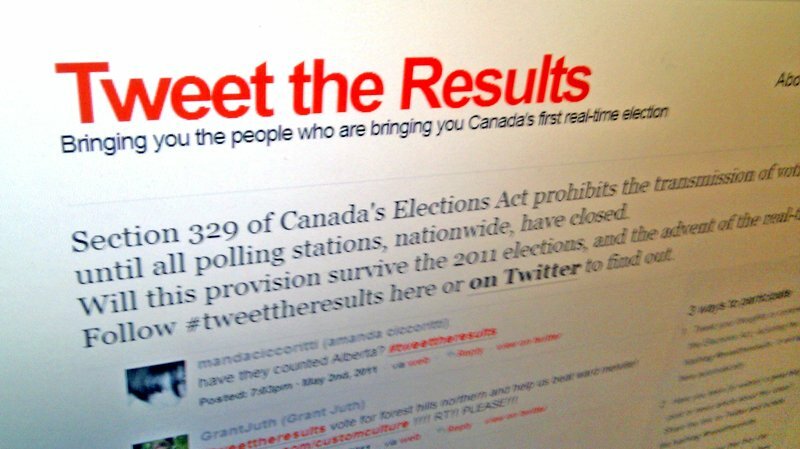 The online home of the movement towards a a real-time election, tweettheresults.ca, simply aggregates tweets containing #tweettheresults. It took Twitter users 30 minutes to break the law, and by 9 PM #tweettheresults was the top trending topic on Twitter in Canada, and the third in the world. Rather than face a potential fine or protracted legal battle, we have taken this site offline for 3 hours. When free speech returns to Canada at 10 pm EST, the site will be back online and you will be able to read all the tweets that have accumulated in the interim. Way to make a statement. I agree the media ecosystem is vastly different from what it was in 1938, but Section 329 has absolutely nothing to do with the government controlling its citizens. It’s there to ensure information equality—a fair vote—plain and simple. We’re lucky to even be able to vote in this way, so show some consideration. Those against Section 329 claim the law makes voters out to be sheep, but it’s realistic to think that if people on the west coast see the Squirrel Party has a landslide in the east, they might change their vote, or not vote at all. People aren’t sheep, but they can be influenced, whether they admit it or not. It might be a different story if the country was flip-flopped, with the major voting centres in the west, but that’s not how it is. What this Twitter-drama comes down to is respect. At the risk of sounding like a fed-up mother, Twitter is a privilege, not a right. You’re a part of an amazing media revolution and just because the media ecosystem evolved, it doesn’t mean you can do and say whatever you want. And it certainly doesn’t mean you’re above the law. You can talk about politics, just don’t tweet the results. It’s only 3 hours, so go back in time and re-learn how to patiently wait for things. Here are the solutions: send a warning by slapping some people with the full fine, have Elections Canada keep all results private until all polls close, or—get ready for it—show some love for your fellow Canadians by not spilling the beans. It’s easy to not tweet results. Just don’t tweet them.